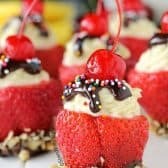 This is a fun take on the good ol’ banana split! Don’t be too scared off by the idea of coring strawberries… it’s actually super simple! Combine heavy cream, cream cheese, powdered sugar and 4 tablespoons instant pudding mix with mixer on medium until thick and fluffy. Fold in banana & pineapple. Place in a ziploc and refrigerate. Wash & dry strawberries. Cut tops off and using a tomato corer, scoop out the center. Cut bottom off and make sure the strawberry stands upright. Stand on a paper towel to dry. Melt chocolate chips for about 25 seconds in the microwave, stir in butter until smooth. Dry each strawberry with a paper towel and dip in chocolate and then in nuts. Place on parchment paper and refrigerate 5 minutes or until set. Cut a corner off of the Ziploc bag and pipe filling into each strawberry. Top with desired toppings (chocolate, sprinkles, cherries).